99 Cents Only Stores is an American price-point retailer chain based in Commerce, California. Previously, the store offered all products at 99¢ or less. Most products are now priced at "99.99¢ or less, but certain products are sold at higher price points." Founded by Dave Gold in 1982, most of the stores are located in Southern California, with others in Arizona, Nevada, and Texas. The company also operates Bargain Wholesale, which sells wholesale to retailers across the United States and exports to more than 15 countries from showrooms in Los Angeles. It also exhibits at trade shows in Las Vegas and Chicago. Gold first came up with the idea as a means to liquidate slow selling wines at his liquor store. "Whenever I'd put wine or cheese on sale for $1.02 or 98 cents, it never sold out," Gold said in a 2001 interview with The Los Angeles Times. "When I put a 99 cent sign on anything, it was gone in no time. I realized it was a magic number." After prompting from a friend, he then created a full store of these bargains. To get publicity, he sold televisions for only 99 cents on the first day, then had family members calling TV stations to ask about the commotion caused by the lines. The practice continues today as a brand new 99 Cents Only Store will sell a high priced item for 99 cents to the first nine customers in line on opening day, and other limited prices for the next 90 new opening day customers. Despite its image, the company operates a basic information technology operation with a computer system ordering stockers in the distribution center and point of sale registers tracking purchases at every store. The Texas distribution center is a former Albertsons facility bought when that company exited the Houston market. In November 2003, a more flexible pricing structure was implemented where items are sold for prices lower than 99 cents (for example, 69 or 49 cents). The management believed that this will permit better management of commodity price increases. Despite having announced on September 18, 2008, that the company would close all stores in Texas, in February 2009, the company decided that it will close only one-third of its Texas stores. The company quoted a rise in sales, and plans to keep the stores open, as long as the stores remain profitable. In October 2011 the company agreed to a $1.6-billion buy-out by private equity firm Ares Management and the CPP Investment Board. The deal was completed on January 13, 2012. New ownership decided to lay off 172-plus employees in October 2013. The Gold family ended their involvement with the company in January 2013. 99 Cents Only Stores advertises that it is open "9 days a week", often invoking humorous commentary on holidays with products sold for 99 cents. One advertisement wished Joan Rivers "Happy 99th Facelift"; another congratulated the Los Angeles "Dodgers on Losing 99 Games." The company also celebrates the 99th birthday of public figures and names 99-year-old individuals as honorary spokespersons. Photographer Andreas Gursky's diptych of the inside of the Hollywood, California, 99 Cents Only store became--at the time of its sale in February 2007--the most expensive photograph ever sold, being auctioned for $3.3 million. 99 Cents Only Stores trucks and vans state that "Our drivers carry 99 cents only". 99 Cents Only Stores allows returns of up to nine items within nine days of purchase and are typically open from 9am-9pm, although individual stores may open at 8 a.m. or close at 10 p.m. The store mottos include: "Do the 99", "Low prices are born here, and raised elsewhere", featuring a picture of a baby chick. A 99 Cents Only store was featured in scenes in the 2002 movie Punch-Drunk Love. ^ Khouri, Andrew (January 25, 2013). "99 Cents Only Stores' family management team departs". Los Angeles Times. Retrieved 17 May 2015. ^ Chang, Andrea (2010-07-22). "99 Cents Only Stores sued over price increase". Los Angeles Times. Retrieved 21 November 2010. ^ a b Li, Shan (April 26, 2013). "Dave Gold dies at 80; entrepreneur behind 99 Cents Only chain". Los Angeles Times. ^ Rae-Dupree, Janet (January 1, 2004). "Case Study: 99 Cents Only Stores' Efficient IT Infrastructure". CIO Insight. Retrieved 17 May 2015. 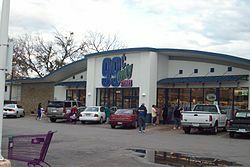 ^ "99 Cents Only Stores(R) Announces a $5.2 Million Loss for the Second Quarter of Fiscal 2008 Ended September 30, 2007". Business Wire (Press release). 8 November 2007. Retrieved 17 May 2015. ^ Jinks, Beth & Burke, Heather (8 September 2008). "99 Cents Only Stores Raises Top Price to 99.99 Cents (Update2)". Bloomberg. Archived from the original on 2015-06-20. ^ Welch, Creighton A. (September 18, 2008). "99 Cents Only closing all its Texas stores". San Antonio Express-News. Archived from the original on 2008-09-20. ^ Halkias, Maria (February 4, 2009). "99 Cents Only Stores to stay open in Texas after all". Dallas Morning News. Archived from the original on 2009-04-04. ^ Chang, Andrea & Li, Shan (12 October 2011). "99 Cents Only Stores agrees to .6-billion buyout". Los Angeles Times. ^ "99 Cents Only Stores: NYSE:NDN quotes & news - Google Finance". Google Finance. Retrieved 17 May 2015. ^ Schonauer, David (March 7, 2007). "The First $3M Photograph". PopPhoto.com. Archived from the original on March 18, 2007. Retrieved August 3, 2017. ^ Levine, Bettijane (January 4, 2003). "Buy low, live high". Los Angeles Times. Retrieved November 9, 2018. Coffey, Brendan (September 30, 2002). "Every penny counts". Forbes. Brott, Tamar (August 2001). "The Price is Right: Why Wall Street Loves Dave Gold's 99 Cent Only Empire". Los Angeles Magazine. 46 (8). pp. 42, 44, 46, 48, 50, 52, 54. ISSN 1522-9149.